This time of year, when the winds start howling and snowflakes start to zig-zag ever so gently to the ground, it’s perfect for getting together with family, friends, loved ones, and all the people you hold dear. And that includes your neighbors and friends throughout the community. In Chippewa Falls, the holidays can be extravagant just as they can be simple. At events all over the city leading up to the end of the year, you can see bright lights, wintery thrills, cheerful songs, and quiet beautiful moments together with the whole community. Here’s a taste of what the season is like in Chippewa Falls. 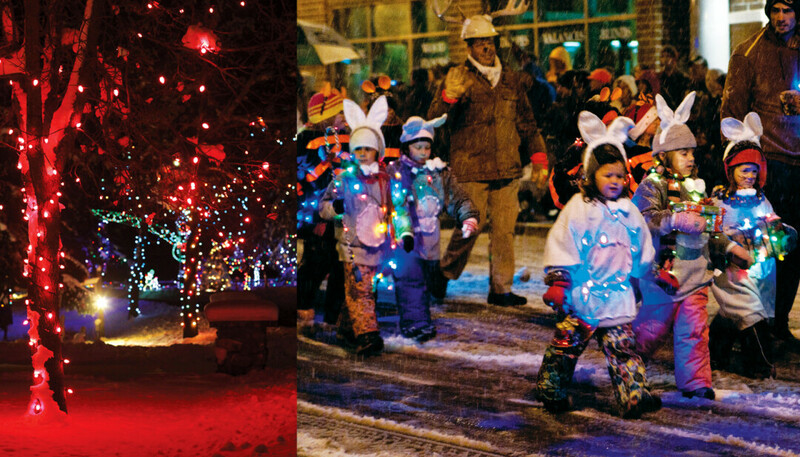 Dec. 5-7, 12-14, & 19-21 • Rides leave at 4:30, 5:30, 6:30, and 7:30pm from the Chippewa Falls Main Street parking lot, 514 N. Bridge St.
Make sure you bundle up for one of the city’s coolest winter activities. You can enjoy a relaxing horse-drawn wagon ride through downtown Chippewa Falls, checking out decorations and lights, and the wagon will take you all the way through the famed Christmas Village in Irvine Park. You’ve got to be vigilant in buying tickets to schedule your family’s ride, though. Tickets go on sale the Friday after Thanksgiving at the Gordy’s Market Service Center (downtown Chippewa Falls location only), so be ready to stand in line for a bit. It’s totally worth it though. Cost is $6 per person (ages 2+). No list of holiday stuff in the Chippewa Valley is complete without a mention of the Christmas Village in Irvine Park. This year marks the 30th anniversary of the stunning light displays that spread out through the whole park. There’s tens of thousands of blinking lights high up in the tallest trees, surrounding the pavilions, and all over the classic life-size Christmas scenes that replicate the Victorian era and the city’s early history. It’s nice for a slow drive through the park (don’t forget to turn your headlights off), a romantic walk with your partner, or a wintery adventure with the whole family. It’s a perfect way to brighten up cold months. The 28th Annual Bridge to Wonderland Parade is just brimming with holiday magic with over 50 illuminated and musical floats, walking units, and horse drawn wagons as they light up Bridge Street with lights and cheer. It’s a beloved Chippewa Falls tradition where you can even see Santa Claus on one of the parade’s last floats. And as an added bonus, if you get a little chilly, you can enjoy complimentary hot drinks at businesses with red carpets. Dec. 7 • 6:30pm • Heyde Center for the Arts, 3 S. High St. Sing your heart out with friends and family at this awesome community-wide singalong. Members of the Chippewa Valley Community Chorus will lead the cheer-lovin’ group through an evening of some of the most loved Christmas carols and the best songs of the season. Singing fortifies your health, enriches your imagination, and gives your life an added zest – plus there is no experience required. It can be fun to just sing, you know. Additionally, there will be Christmas trivia games with prizes. The event is open to anyone with a free will donation. Arrival: Nov. 24 • 10am • BMO Harris Bank Parking Lot • 411 Bridge St.
Santa’s House: Saturdays in Nov. & ​Dec.​ • 11am to 3pm • Rutledge Charity Building • ​404 N. Bridge St. It is always a surprise to see how Santa and Mrs. Claus arrive in Chippewa Falls each year. On Nov. 24, you can come enjoy the anticipation of their arrival at the BMO Harris Bank parking lot, where all children in attendance will receive a special ornament from Santa himself! Then for the rest of the month, visit with Santa and let him know your Christmas wishes at his house across the street. Santa’s House is open every Saturday after his arrival until Christmas. So yeah, Chippewa Falls has a lot going for it when it comes to holiday cheer. Whether you’re looking to get Christmas-y with family, friends, or with the whole community, Chippewa’s got you covered. Enjoy!